Use the Spa Cover Guard to protect your expensive hot tub cover from ice, snow, tree sap, harsh rain, and UV damage. The Cover Guard is extremely durable, water resistant and designed to work in all climates. Its 12-inch skirt features elasticized hem corners for easy installation and removal. NOTE: This product is not a safety cover nor an insulating cover, it is not intended to be a replacement for a standard insulating foam core-equipped spa cover. It is intended to protect your existing insulating cover and provide it prolonged life. Operating Instructions: Always remove the Cover Guard before opening or closing your insulating hard cover. Failure to remove the Cover Guard can result in excessive stretching and damage/tearing. This will invalidate any warranty stated. This Bar Table is designed to be used alongside other items from the Square Spa Surround Furniture collection to create the ultimate outdoor oasis that perfectly surrounds your square or rectangular spa. It features an attractive wicker finish, constructed of a durable, weather resistant, synthetic rattan over a rust-proof, heavy-gauge aluminum frame. It includes a tempered glass-top allowing you to conveniently relax in the spa with a drink by your side. 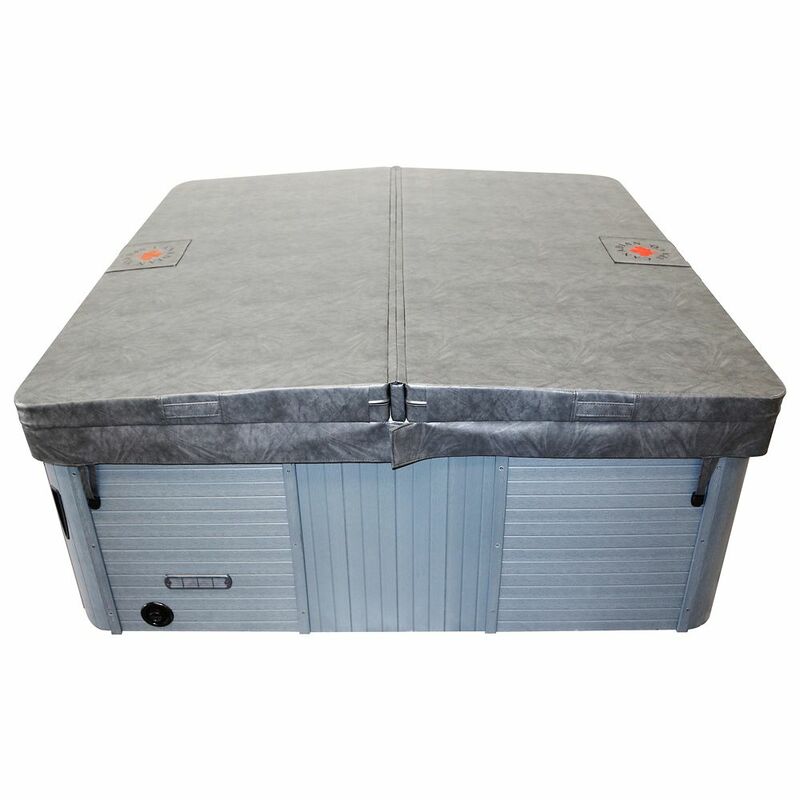 94-inch x 88-inch Rectangular Hot Tub Cover with 5-inch/3-inch Taper in Grey Canadian Spa Company hot tub and spa covers provide unbeatable quality at an affordable price. Our covers are made from the strongest marine grade vinyl in the industry to withstand the harsh winter months and are both UV and mildew resistant. 6 re-enforced handles are built in at convenient points for carrying your spa cover and for simple cover removal. Adding to this support are 8 locking straps which fasten to the corners of the tub which are ideal for locations with lots of wind. The extra-thick 5 in/3 in insulating foam inside the cover is vacuum sealed with a 6 mil double coated polyethylene vapour barrier to increase the longevity of the cover and retain water temperature within the spa. For additional support, a metal C channel is added at the centre of each foam insert. Our cover includes an extra thick full-length steam seal inside the fold to trap any excess heat that would escape through the side of the cover and minimize heat loss.